Expanding your business isn’t always easy. It doesn’t matter if you have a commercial business, construction site or even if you work for the military, expanding your land can be tough. This isn’t always due to space management issues, problems can often arise simply from having a lack of security. There are several benefits of prefabricated security guard houses, and installing one on your property could help eliminate some of the common issues that we see on large properties. Learn more about how a guard booth can help your company grow. The best prefabricated security guard houses are small structures located in the parking lot or entrance way of a property. The most common designs will have space for a single attendant to greet those who walk by. There will be storage space for any equipment that the guard needs and space for them to sit. Because they are covered and built with very strong materials, you won’t need to worry about your security staff being exposed to rain or extreme weather conditions. They will be able to do their job in comfort with the best guard booth available online. Having portable buildings has a lot of benefits. When it comes to security booths, this is especially important. Not only will your new guard shack arrive pre-assembled, it can be moved as is whenever needed. This allows you to change your layout to improve your security as needs change, or completely change locations, depending on your business. A Panel Built guard booth will follow a modular structure. Modular buildings are made in large pieces off-site and then delivered to you. This helps you avoid construction inconveniences and helps to speed up production. Your guard house will arrive ready to use no matter which additional features you choose or the location you choose to place it. This allows you to start using it right away. Prefabricated guard houses can help you outside and inside larger buildings as well. 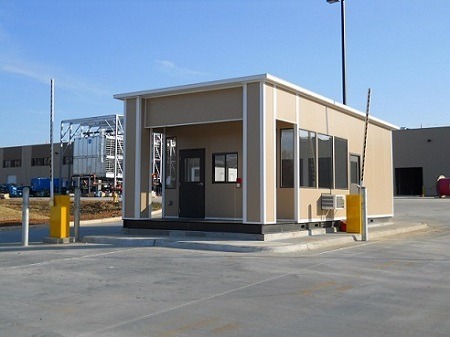 Many factories choose to add modular guard houses to their buildings to serve as employee check points. These pre-assembled buildings can also be added to a second floor or mezzanine system, giving your security guards the power to oversee in-house activities. The guard booths do not need to be disassembled in order to be lifted. The goal of a prefabricated guard house is to give your security staff access to the tools they need to do their jobs. A guard house by Panel Built can be custom made to fit the needs of your staff. Add cameras to monitor the property or change the layout to better suit your needs. Create guard houses with a drive-thru window to help screen people that enter your property. Make your staff more comfortable by adding heating or cooling units to the security booths. By working with experienced companies that sell security booths online, you can find the most efficient ways to increase business security. Panel Built, for example, has years of experience creating modular structures specifically designed to improve the security of businesses. Discuss your needs with a customer service representative to learn more about how a Panel Built security booth can help improve your business. The decision to find a guard booth available online for sale is important. 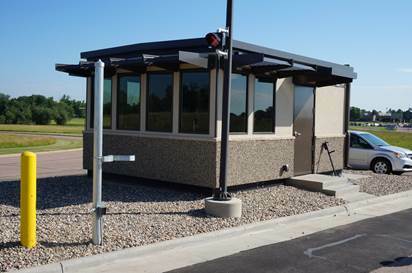 Whether you need to create additional security check points or just need a spot for your guards to monitor the premises, purchasing a guard booth is the first step. A portable guard house can help several different industries. Use a Panel Built security booth in commercial, industrial and military buildings to help improve security. By buying online, you are saving both time and money, allowing you to get the space you need much faster. Panel Built works as quickly as possible to produce security booths that you can be proud to call your own. There are several places where a business can find a prefabricated security booth online, but none are quite like Panel Built. The Panel Built security booth company online has years of experience working with companies on a personal level to help give them a product that they can truly use. We pride ourselves on unmatched craftsmanship and excellent customer service. When you start shopping for a new guard booth, you will learn how much prices can vary on modular buildings. One of the reasons why so many companies turn to Panel Built is because we work to provide you with the lowest prices without sacrificing our quality. We operate mostly online to help reduce our overhead costs and pass the savings along to you. Another thing that you should consider when wondering where to buy prefabricated guard houses is that every modular property we offer is customizable. Many of our customers add to their guard houses later on or include them in much larger projects. If you are looking for a reliable guard booth that is durable and arrives ready to use, then look no further than Panel Built. We strive to go above and beyond your expectations when it comes to construction. Contact us today to learn more about the guard booths we have to offer and how they can help improve your security.